Download "MUNICIPAL REGULATIONS for CLINICAL NURSE SPECIALISTS"
2 CHAPTER 60 CLINICAL NURSE SPECIALIST Secs Applicability 6001 General Requirements 6002 Term of Certificate 6003 Renewal of Certificate 6004 Educational Requirements 6005 National Examination and Certification 6006 Certification by Endorsement 6007 Standards of Conduct 6008 Scope of Practice 6009 Prescriptive Authority 6010 Prescribing Controlled Substances 6011 [Repealed] 6012 Use of Titles or Abbreviations 6013 Practice Of A Certified Registered Nurse-Practitioner In Health Care Facilities Requiring A Formal Evaluation 6014 Supervised Practice of Students 6015 Supervised Practice of Graduates 6016 Supervised Practice of Applicants for Certification by Endorsement 6099 Definitions 6000 APPLICABILITY A clinical nurse specialist is an expert clinician and clinical leader in a particular specialty or subspecialty of nursing and is prepared in a formal educational program to assume an expanded role in providing health care services. The clinical nurse specialist possesses refined knowledge and skills pertinent to the medical needs of patients in a specialty area. 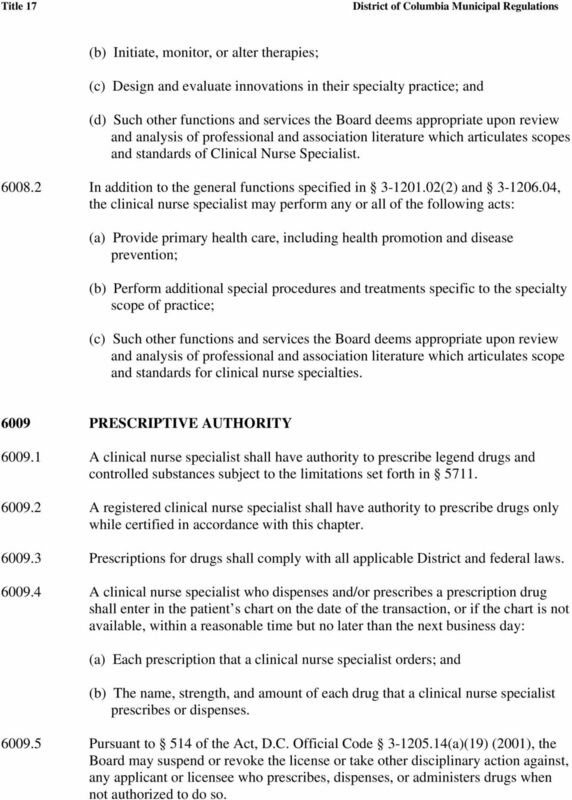 Clinical nurse specialists, when functioning within their scope of practice, are qualified to assume primary responsibility for the care of their clients Chapters 40 (Health Occupations: General Rules), 41 (Health Occupations: Administrative Procedures), and 54 (Registered Nursing) of this title shall supplement this chapter GENERAL REQUIREMENT Only a person currently licensed as a registered nurse under chapter 54 of this title shall be eligible to apply for a certificate to practice as a clinical nurse specialist under this chapter TERM OF CERTIFICATE Subject to , a certificate issued to this chapter shall expire at 12:00 midnight of June 30 of even-numbered year. 3 If the Director changes the renewal system pursuant to of chapter 40 of this title, a certificate issued pursuant to this chapter shall expire at 12:00 midnight of the last day of the month of the birthdate of the holder of the certificate, or other date established by the Director RENEWAL OF CERTIFICATE A holder of a certificate to practice as a clinical nurse specialist shall renew his or her certificate by submitting a completed application on the forms required by the Board and paying the required fees prior to the expiration of the certificate The Board s staff shall mail out applications for renewal at least sixty (60) days prior to the date the certificate expires A certificate holder shall have the burden of notifying the Board if a renewal notice is not received A certificate holder shall notify the Board in writing of a change of home or business address within thirty (30) days after the change A certificate holder applying for renewal of a certificate to practice clinical nurse specialty shall: (a) Maintain current licensure as a registered nurse in the District of Columbia; (b) Submit evidence of current national certification or recertification, as applicable, by the American Nurses Credentialing Center (ANCC) or any other nationally recognized certifying organization accepted by the Board; and (c) Beginning with the 2006 renewal period, submit proof of completion of fifteen (15) contact hours of continuing education, which shall include a pharmacology component. A continuing education program, course, seminar, or workshop shall be approved by the ANCC or other nationally certifying body recognized by the Board and shall be related to the certificate holder s specialty. Only continuing education hours obtained in the two (2) years immediately preceding the application date will be accepted A certificate holder shall submit a verification form of completion, for each program, course, seminar, or workshop for which continuing education is claimed A certificate holder applying for renewal of a certificate who fails to submit proof of having completed the requirements as set forth in by the date the certificate expires may renew the certificate within sixty (60) days after the expiration by submitting the required documents and paying the required late fees. 5 pharmacotherapeutics course within the last five (5) years as it relates to the clinical nurse specialists scope of practice An applicant shall submit proof of having obtained a passing score on the ANCC certification examination by arranging to have official written certification of the certified copy of the examination results, sent to the Board A national certification program acceptable to the Board shall provide: (a) A scope of practice statement that reflects the standards of specialized and advanced nursing practice in the area of certification; (b) An approval process for the formal programs of study in the area of certification which shall: (1) Be based on measurable objectives that relate directly to the scope of practice; (2) Include theoretical and clinical content directed to the objectives; and (3) Be equivalent to at least one academic year preceptorship which is part of the formal program and shall be included as part of the academic year. Current practice in the area of certification will not be accepted as a substitute for the formal program of study. 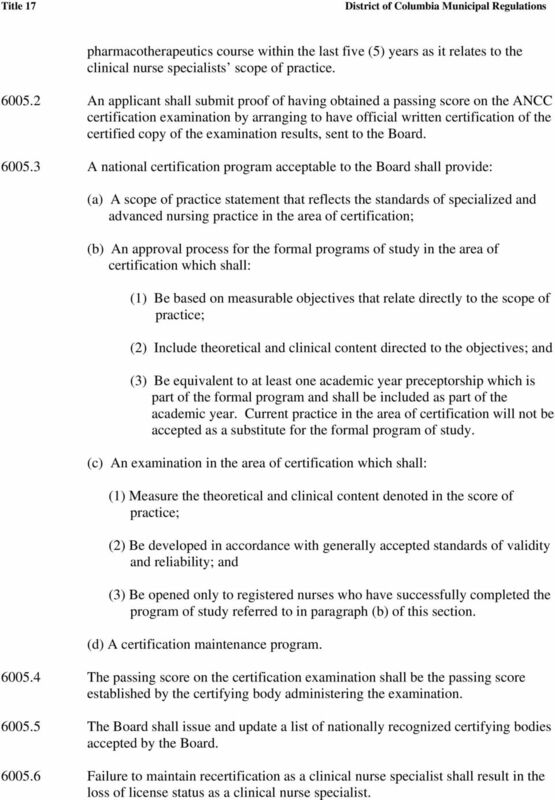 (c) An examination in the area of certification which shall: (1) Measure the theoretical and clinical content denoted in the score of practice; (2) Be developed in accordance with generally accepted standards of validity and reliability; and (3) Be opened only to registered nurses who have successfully completed the program of study referred to in paragraph (b) of this section. 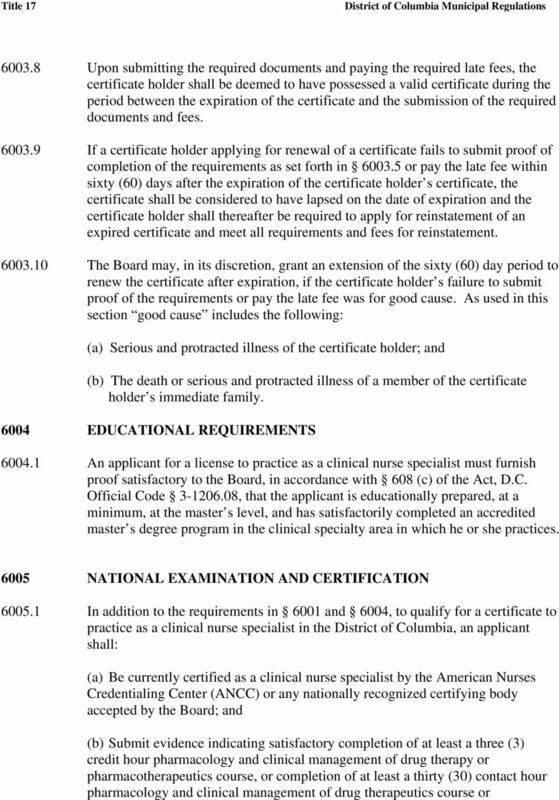 (d) A certification maintenance program The passing score on the certification examination shall be the passing score established by the certifying body administering the examination The Board shall issue and update a list of nationally recognized certifying bodies accepted by the Board Failure to maintain recertification as a clinical nurse specialist shall result in the loss of license status as a clinical nurse specialist. 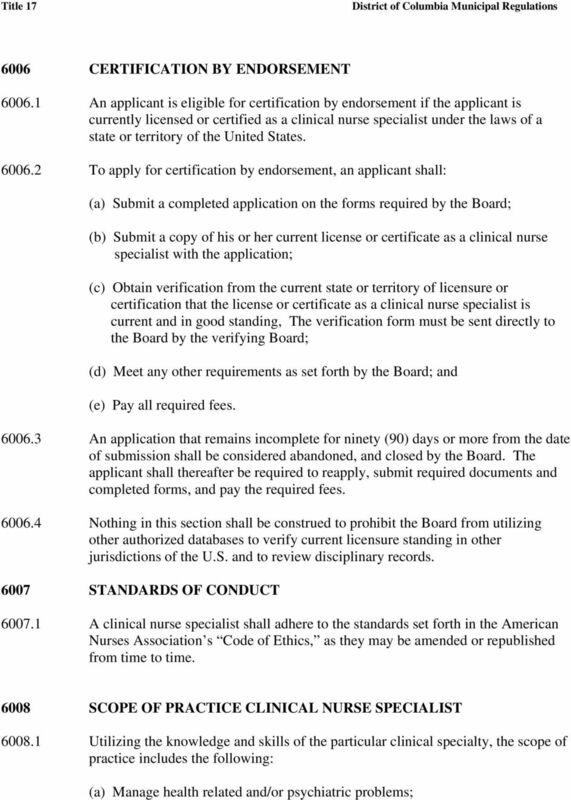 7 (b) Initiate, monitor, or alter therapies; (c) Design and evaluate innovations in their specialty practice; and (d) Such other functions and services the Board deems appropriate upon review and analysis of professional and association literature which articulates scopes and standards of Clinical Nurse Specialist In addition to the general functions specified in (2) and , the clinical nurse specialist may perform any or all of the following acts: (a) Provide primary health care, including health promotion and disease prevention; (b) Perform additional special procedures and treatments specific to the specialty scope of practice; (c) Such other functions and services the Board deems appropriate upon review and analysis of professional and association literature which articulates scope and standards for clinical nurse specialties PRESCRIPTIVE AUTHORITY A clinical nurse specialist shall have authority to prescribe legend drugs and controlled substances subject to the limitations set forth in A registered clinical nurse specialist shall have authority to prescribe drugs only while certified in accordance with this chapter Prescriptions for drugs shall comply with all applicable District and federal laws A clinical nurse specialist who dispenses and/or prescribes a prescription drug shall enter in the patient s chart on the date of the transaction, or if the chart is not available, within a reasonable time but no later than the next business day: (a) Each prescription that a clinical nurse specialist orders; and (b) The name, strength, and amount of each drug that a clinical nurse specialist prescribes or dispenses Pursuant to 514 of the Act, D.C. Official Code (a)(19) (2001), the Board may suspend or revoke the license or take other disciplinary action against, any applicant or licensee who prescribes, dispenses, or administers drugs when not authorized to do so. 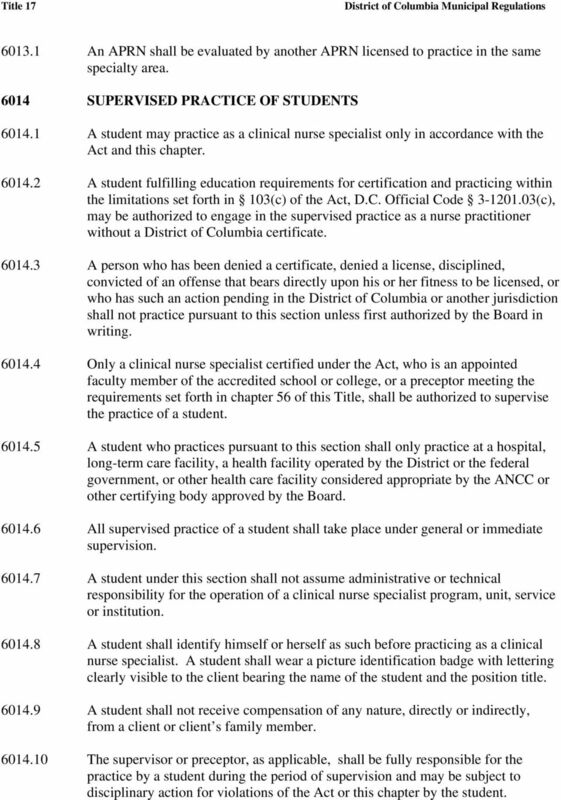 9 An APRN shall be evaluated by another APRN licensed to practice in the same specialty area SUPERVISED PRACTICE OF STUDENTS A student may practice as a clinical nurse specialist only in accordance with the Act and this chapter A student fulfilling education requirements for certification and practicing within the limitations set forth in 103(c) of the Act, D.C. Official Code (c), may be authorized to engage in the supervised practice as a nurse practitioner without a District of Columbia certificate A person who has been denied a certificate, denied a license, disciplined, convicted of an offense that bears directly upon his or her fitness to be licensed, or who has such an action pending in the District of Columbia or another jurisdiction shall not practice pursuant to this section unless first authorized by the Board in writing Only a clinical nurse specialist certified under the Act, who is an appointed faculty member of the accredited school or college, or a preceptor meeting the requirements set forth in chapter 56 of this Title, shall be authorized to supervise the practice of a student A student who practices pursuant to this section shall only practice at a hospital, long-term care facility, a health facility operated by the District or the federal government, or other health care facility considered appropriate by the ANCC or other certifying body approved by the Board All supervised practice of a student shall take place under general or immediate supervision A student under this section shall not assume administrative or technical responsibility for the operation of a clinical nurse specialist program, unit, service or institution A student shall identify himself or herself as such before practicing as a clinical nurse specialist. A student shall wear a picture identification badge with lettering clearly visible to the client bearing the name of the student and the position title A student shall not receive compensation of any nature, directly or indirectly, from a client or client s family member The supervisor or preceptor, as applicable, shall be fully responsible for the practice by a student during the period of supervision and may be subject to disciplinary action for violations of the Act or this chapter by the student. 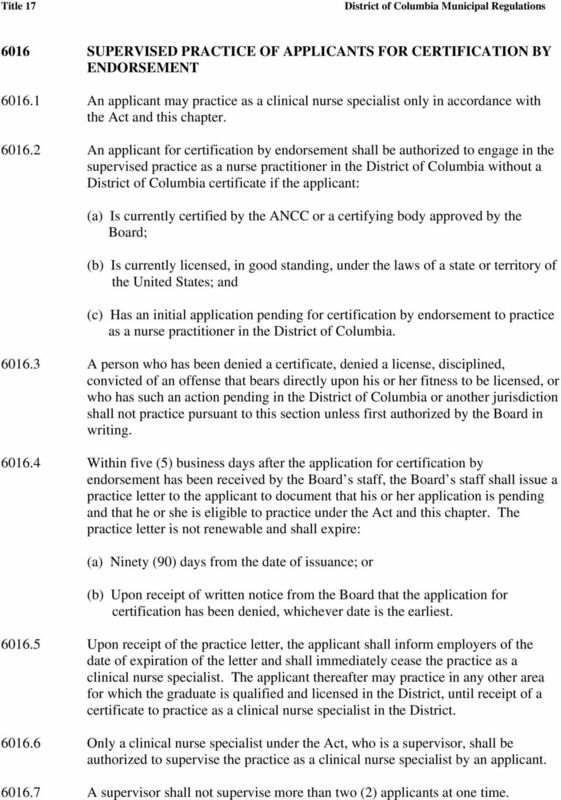 10 The Board may deny an application for certification by, or take other disciplinary action against, a student who is found to have violated the Act or this chapter. 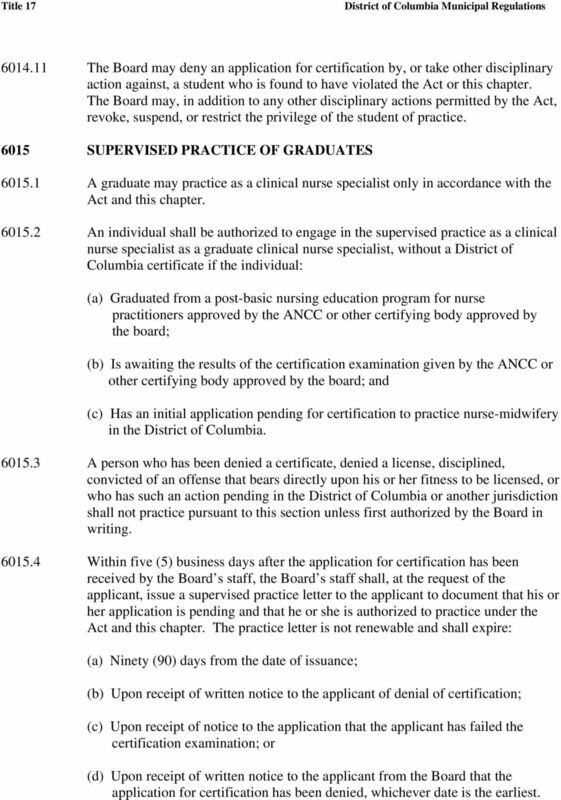 The Board may, in addition to any other disciplinary actions permitted by the Act, revoke, suspend, or restrict the privilege of the student of practice SUPERVISED PRACTICE OF GRADUATES A graduate may practice as a clinical nurse specialist only in accordance with the Act and this chapter An individual shall be authorized to engage in the supervised practice as a clinical nurse specialist as a graduate clinical nurse specialist, without a District of Columbia certificate if the individual: (a) Graduated from a post-basic nursing education program for nurse practitioners approved by the ANCC or other certifying body approved by the board; (b) Is awaiting the results of the certification examination given by the ANCC or other certifying body approved by the board; and (c) Has an initial application pending for certification to practice nurse-midwifery in the District of Columbia A person who has been denied a certificate, denied a license, disciplined, convicted of an offense that bears directly upon his or her fitness to be licensed, or who has such an action pending in the District of Columbia or another jurisdiction shall not practice pursuant to this section unless first authorized by the Board in writing Within five (5) business days after the application for certification has been received by the Board s staff, the Board s staff shall, at the request of the applicant, issue a supervised practice letter to the applicant to document that his or her application is pending and that he or she is authorized to practice under the Act and this chapter. The practice letter is not renewable and shall expire: (a) Ninety (90) days from the date of issuance; (b) Upon receipt of written notice to the applicant of denial of certification; (c) Upon receipt of notice to the application that the applicant has failed the certification examination; or (d) Upon receipt of written notice to the applicant from the Board that the application for certification has been denied, whichever date is the earliest. 11 Upon receipt of the practice letter, the graduate shall inform employers of the date of expiration of the letter and shall immediately cease as a clinical nurse specialist on that date or upon receipt of the written notice as set forth in , whichever date is the earliest. The graduate thereafter may practice in any other area for which the graduate is qualified and licensed in the District, until receipt of a certificate to practice as a clinical nurse specialist in the District The graduate shall immediately notify the Board and the graduate s supervisor of the results of the certification examination Only a nurse practitioner certified under the Act, who is a supervisor, shall be authorized to supervise practice as a clinical nurse specialist by a graduate A supervisor shall not supervise more than two (2) graduates at one time All supervised practice of a graduate shall take place under general or immediate supervision A graduate who practices pursuant to this section shall only practice at a hospital, long-term care facility, a health facility operated by the District or federal government, or other health care facility considered appropriate and approved by the Board A graduate practicing under this section shall not assume administrative or technical responsibility for the operation of a clinical nurse specialist program, unit, service, or institution A graduate shall identify himself or herself as such before practicing as a clinical nurse specialist. A graduate shall wear a picture identification badge with lettering clearly visible to the client bearing the name of the graduate and the position title A graduate shall not receive compensation of any nature, directly or indirectly, from a client or client s family member, except for a salary based on hours worked under supervision The supervisor shall be fully responsible for the practice by a graduate during the period of supervision and may be subject to disciplinary action for violations of the Act or this chapter by the graduate The Board may deny an application for a certificate by, or take other disciplinary action against, a graduate who is found to have violated the Act or this chapter. The Board may, in addition to any other disciplinary actions permitted by the Act, revoke, suspend, or restrict the privilege of the graduate to practice. 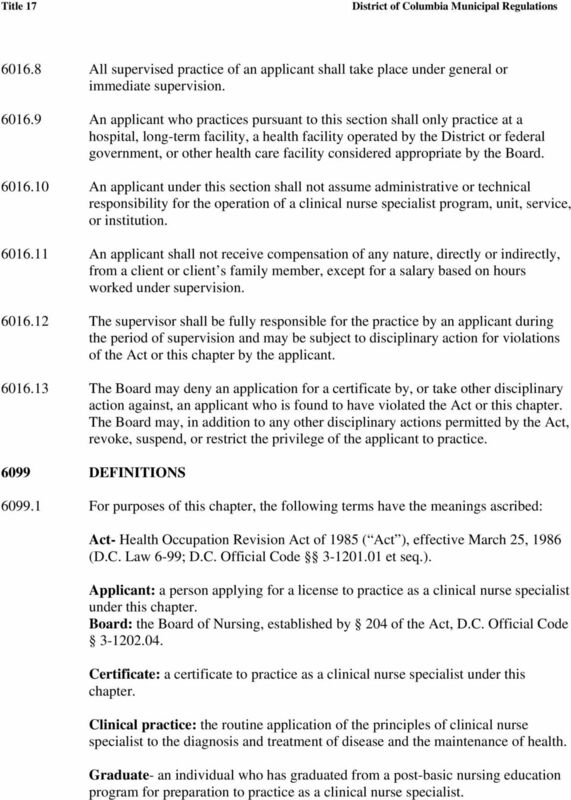 12 6016 SUPERVISED PRACTICE OF APPLICANTS FOR CERTIFICATION BY ENDORSEMENT An applicant may practice as a clinical nurse specialist only in accordance with the Act and this chapter An applicant for certification by endorsement shall be authorized to engage in the supervised practice as a nurse practitioner in the District of Columbia without a District of Columbia certificate if the applicant: (a) Is currently certified by the ANCC or a certifying body approved by the Board; (b) Is currently licensed, in good standing, under the laws of a state or territory of the United States; and (c) Has an initial application pending for certification by endorsement to practice as a nurse practitioner in the District of Columbia A person who has been denied a certificate, denied a license, disciplined, convicted of an offense that bears directly upon his or her fitness to be licensed, or who has such an action pending in the District of Columbia or another jurisdiction shall not practice pursuant to this section unless first authorized by the Board in writing Within five (5) business days after the application for certification by endorsement has been received by the Board s staff, the Board s staff shall issue a practice letter to the applicant to document that his or her application is pending and that he or she is eligible to practice under the Act and this chapter. The practice letter is not renewable and shall expire: (a) Ninety (90) days from the date of issuance; or (b) Upon receipt of written notice from the Board that the application for certification has been denied, whichever date is the earliest Upon receipt of the practice letter, the applicant shall inform employers of the date of expiration of the letter and shall immediately cease the practice as a clinical nurse specialist. The applicant thereafter may practice in any other area for which the graduate is qualified and licensed in the District, until receipt of a certificate to practice as a clinical nurse specialist in the District Only a clinical nurse specialist under the Act, who is a supervisor, shall be authorized to supervise the practice as a clinical nurse specialist by an applicant A supervisor shall not supervise more than two (2) applicants at one time. 13 All supervised practice of an applicant shall take place under general or immediate supervision An applicant who practices pursuant to this section shall only practice at a hospital, long-term facility, a health facility operated by the District or federal government, or other health care facility considered appropriate by the Board An applicant under this section shall not assume administrative or technical responsibility for the operation of a clinical nurse specialist program, unit, service, or institution An applicant shall not receive compensation of any nature, directly or indirectly, from a client or client s family member, except for a salary based on hours worked under supervision The supervisor shall be fully responsible for the practice by an applicant during the period of supervision and may be subject to disciplinary action for violations of the Act or this chapter by the applicant The Board may deny an application for a certificate by, or take other disciplinary action against, an applicant who is found to have violated the Act or this chapter. The Board may, in addition to any other disciplinary actions permitted by the Act, revoke, suspend, or restrict the privilege of the applicant to practice DEFINITIONS For purposes of this chapter, the following terms have the meanings ascribed: Act- Health Occupation Revision Act of 1985 ( Act ), effective March 25, 1986 (D.C. Law 6-99; D.C. Official Code et seq.). 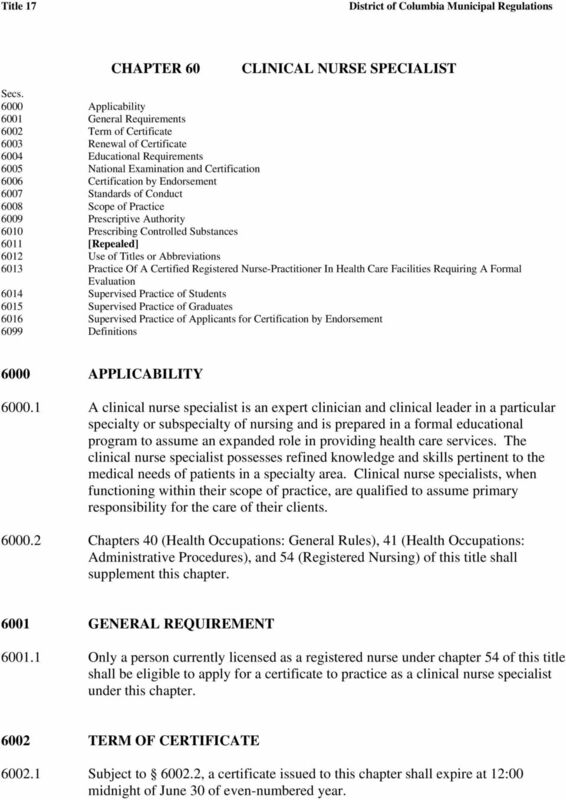 Applicant: a person applying for a license to practice as a clinical nurse specialist under this chapter. 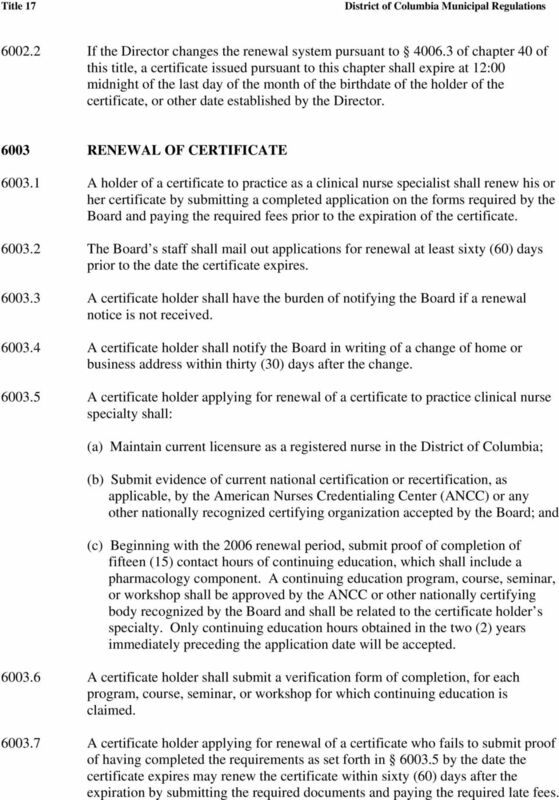 Board: the Board of Nursing, established by 204 of the Act, D.C. Official Code Certificate: a certificate to practice as a clinical nurse specialist under this chapter. Clinical practice: the routine application of the principles of clinical nurse specialist to the diagnosis and treatment of disease and the maintenance of health. Graduate- an individual who has graduated from a post-basic nursing education program for preparation to practice as a clinical nurse specialist. 14 Nationally recognized certifying body: is one that offers a national certification examination in the specialty area of advanced nursing practice, utilizes standards and principles of the American Board of Nursing Specialties (ABNS), and provides a mechanism for evaluating continued competency in the specialty area of nursing practice. Supervisor: means a certified clinical nurse specialist who is responsible for the supervision of a student, graduate, or applicant. The definitions in 4099 of chapter 40 of this title are incorporated by reference into and are applicable to this chapter. ARTICLE 7. 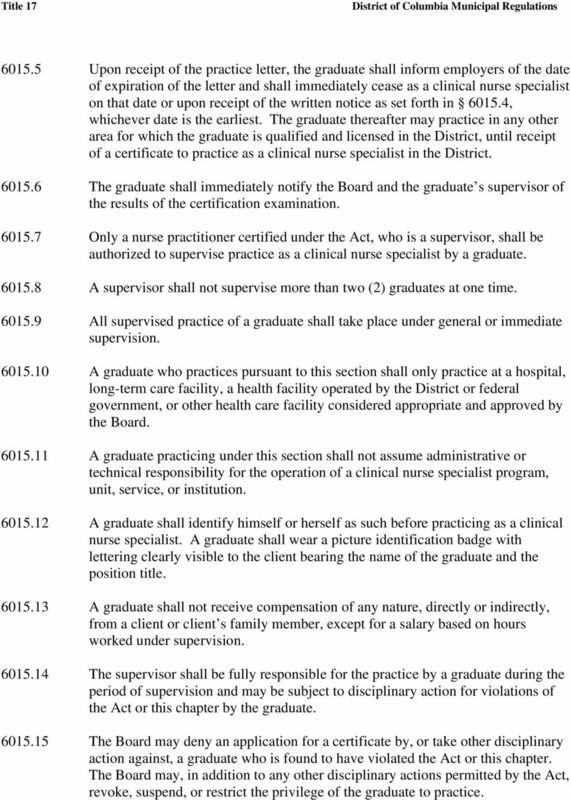 SOUTH CAROLINA PHYSICIAN ASSISTANTS PRACTICE ACT SECTION 40-47-905. Short title. This article may be cited as the "South Carolina Physician Assistants Practice Act". SECTION 40-47-910. Definitions. 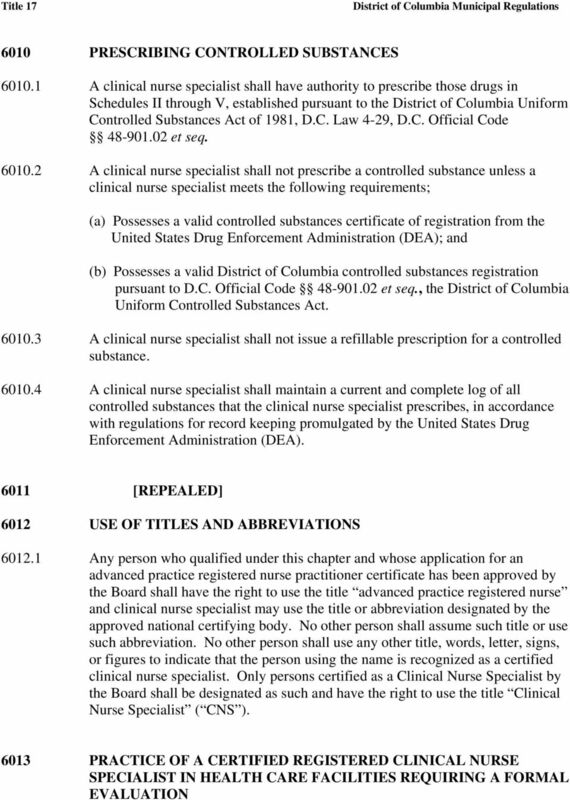 DISTlllcT OF COLUMBIA REGlSfER MAR 8 2007 DEPARTMENT OF HEALTH NOTICE OF FINAL RULEMAKING The Director of the Department of Health, pursuant to the authority set forth under section 302(14) of the D.C.
CR 14-002. An order of the Board of Nursing to repeal and recreate chapters N 2 and 3 relating to nurse licensure and examining councils.